We are adding a Foot Care Set. It includes a scrub, lotion and refreshing mist! I use mine all the time! A perfect pick me up for tired feet. Someone is going to receive tho wonderful Fall Giveaway Box! Shipped right to their home. I am adding the Rafflecopter here along with adding one new method of entry. It will be added to the bottom of the Rafflecopter. *The links in this post are affiliate links and I will receive a small commission if you make a purchase after clicking on my link. You scream, I scream, we all scream for ice cream! In a recent edition of the USA Edition featuring Oregon, not only did kids learn about a new state, but they also got to put on their chefs hat and whip up a tasty ice cream recipe for the whole family...a great way to stay cool during these hot summer days. This is just one of the many surprises you can expect to find with a monthly subscription to Little Passports. Discover the Little Passports USA Edition and bring the learning adventure home! Thanks for stopping in! See you soon! At the Fence! Awaiting the Launch of iPhone 6! As the world eagerly awaits the launch of the iPhone 6, the value of older model iPhones starts to tick downward. To help consumers get the best value, Gazelle is extending its industry-leading price lock guarantee for orders placed before September 9th, but they will need to act fast to get the best price! With this offer, consumers have until October 10th to send in their old phone, allowing them to wait until the new iPhone is in-hand. Use the funds towards an upgrade or pocket the extra cash…it’s a win-win! Visit Gazelle today, and see what your iPhone is worth! I know it’s summer and you probably don’t even want to think about buying your holiday presents (and, if you do, can you tell me your secret to being so organized? ), but I came across a great way to turn the summer fun you’re having right now—like vacations, pool parties, and barbecues—into great presents. Creative presents. One-of-a-kind presents. Curious? Check it out. See how you can make your favorite photos into custom photo books. Plus, check out the great schedule below to keep you on track for holiday delivery! Thanks for stopping in today! See you soon, At the Fence. WorkIt Wednesday : Martial Arts Tournament 2014! This is the first of my posts for WorkIt Wednesday! Every Wednesday I will either review relevant products, share some tips, what I have been doing recently for my Workouts, etc. This first one is about the 2014 Martial Arts Tournament! Came away with Ten Trophies Total! Four of us participated (H., M., E., and myself! ), and everyone did each category -- Weapons Forms, Empty-Hand Forms, and Sparring. In Weapons Forms, H. and myself took first, E. took second. Our Empty-Hand Forms. H., E., and myself took First Place, M. took Second. H. did a higher form called Yul-Kuk, and the rest of us did Sae Jong Young. Then we all Sparred. In this category H. took third, E. took third, and I took second. So, here is an assortment of pictures from our Tournament. We are also looking at participating in one later on this year, so I'll try and keep you updated. Leave a comment with what you think the news is, and let's see if anyone can guess it. This evening I want to share a company called kidecals. They have ALL SORTS of labels, stickers, decals, etc. 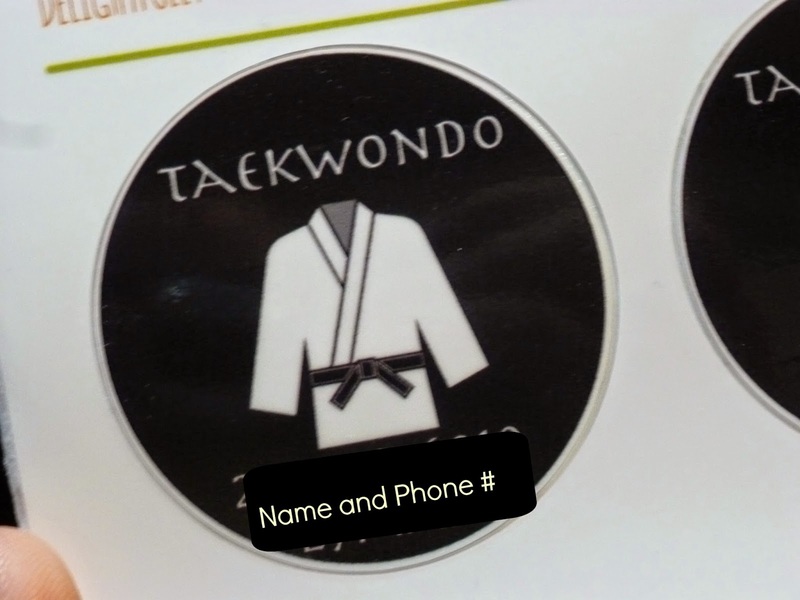 We chose the Sporty Karate Stickers and personalized them for the four of us that take TaeKwonDo. 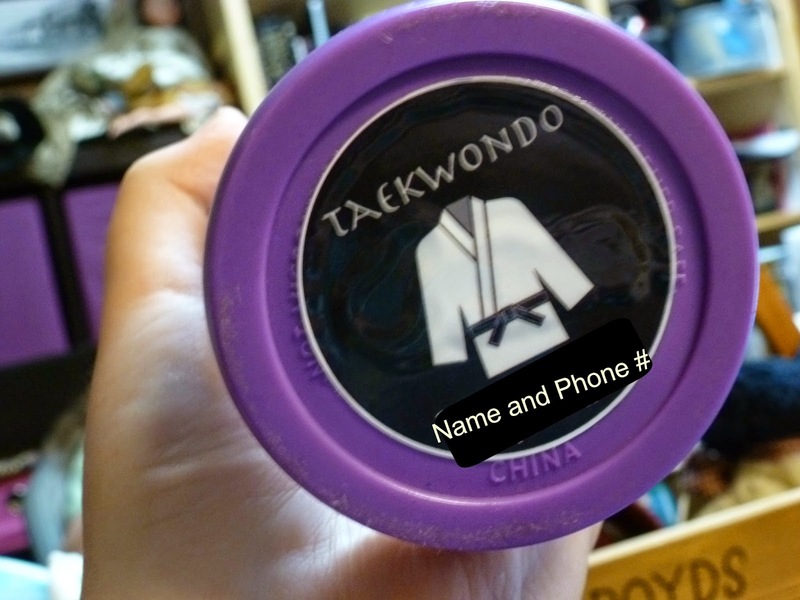 It has our name, our phone number, and TaeKwonDo. These are the big stickers! 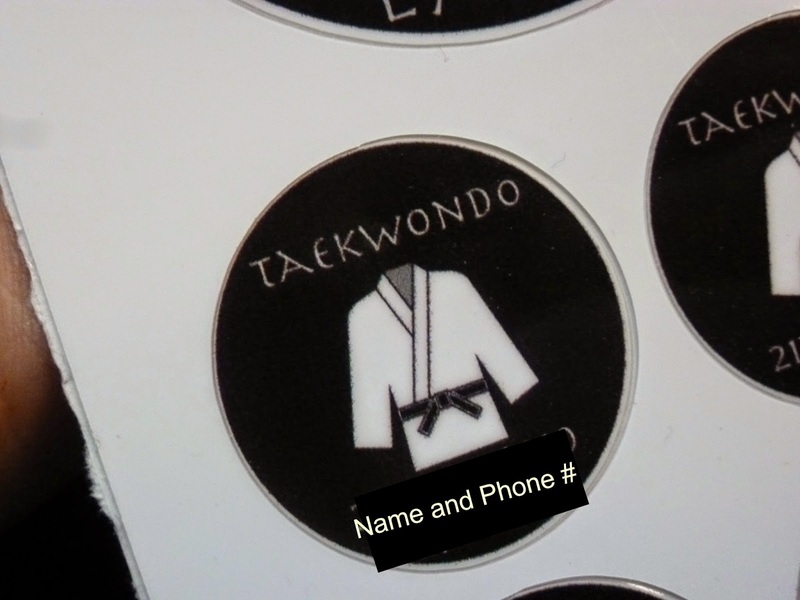 Here is a little bit about kidecals personalized name labels... "Our wall decals are printed on a self-adhesive premium-quality, calendered vinyl with a special, removable acrylic adhesive and printed with ecosol inks. Our waterproof name labels are printed onto a really durable self-adhesive vinyl with eco sol inks and laminated with clear topcoat to ensure durability. I am constantly researching to find the best and greenest materials and printing processes available while trying to keep my kids name labels and decals affordable and local." The set we chose (The Mega Set!) came with 24 two inch labels and 48 one inch labels. We have put several of these on our Gear (Waterbottles, MouthGuard Case, some Sparring Gear, etc.) so that when we are at Tournament/Class we can always tell our things apart from other students there. So, kidecals is well worth visiting and purchasing from! They have many different styles and designs on their website that you can choose from. Looking for stickers for school? Have those! Looking for stickers/labels for other sports? Have those! You can also Like them on Facebook and Follow them on Twitter to stay up to date with their latest news about products and sales. These are the little stickers! Disclosure : I received no monetary compensation for this review. I did receive product for review purposes only. All thoughts and opinions are mine. All quotes in red are taken from the sponsor's website. As you well know Mondays are now our Petacular Mondays. We will be sharing all kinds of pet products and information. Our first product is from Farewell. It is the first complete pet urn kit. Over the years with six children, the oldest is now 29 and the youngest 13, we have experienced the loss of a pet. It never is easy. I think one of the hardest was right before we went on the road and my son's German Shepherd, that was supposed to go with us, ran out into the road and was hit by a pickup truck. It was the dead of winter in Maine and there was no way we could bury her. We actually had to wrap her up and store her body until we found a vet that could cremate her. It was not fun, nor was it easy. One of the Farewell Urns would have made a big difference. My son still loves shepherds, but she has always been his favorite. 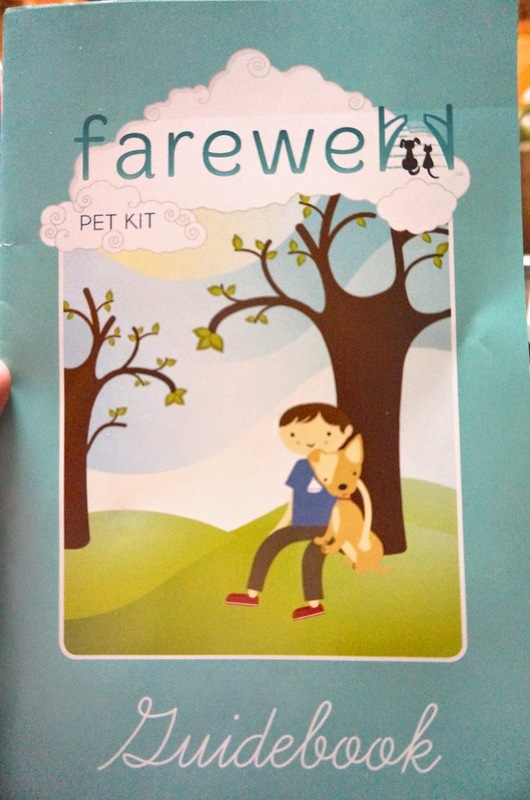 The Farewell Pet Kit can also be used to store favorite items from your pet if you are not going to have them cremated. More like a memory box than an urn. You can save their collar, favorite toy, or item your pet seemed to enjoy. The kit is easy to put together and then decorate. There is also a small nameplate you can add. If you use it as a memory box you or your child will be able to open it and look at the items you placed inside. What was your pet's name? 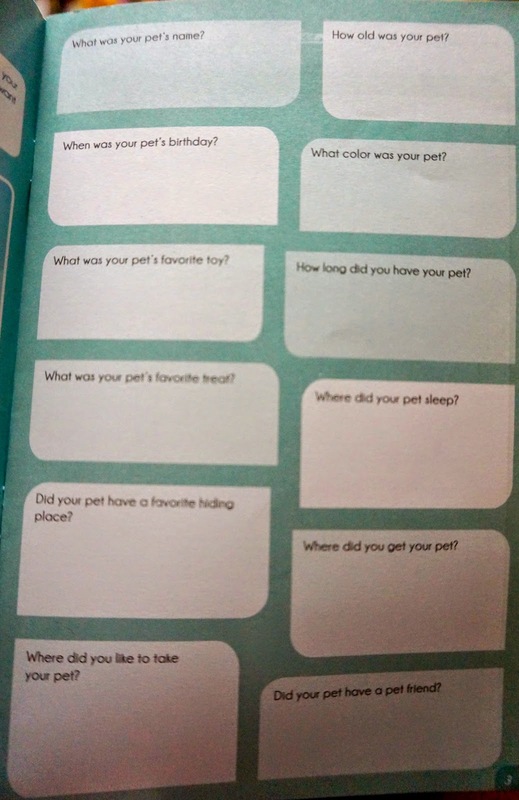 How long did you have your pet? Where did your pet sleep? There are pages to attach a picture or draw one of your own. The Guidebook has a section for Adults, Adolescents and Children. Each one gives some ideas of how to deal with the loss of a pet. The last few pages of the book are designed to help you plan a burial service if you choose to bury your pet. Listed are a few poems and then how you could go about having an actual service. I believe Farewell Pet Kits could really assist someone with the loss of a pet. We become attached to our pets and this will help someone to deal with the loss, or allow them to help their children deal with loss. You can purchase the kit we reviewed for $57.48. They do carry other kits in a variety of sizes. The Farewell Pet Kit was born out of need. Our family dog grew up with the children. Our three children couldn’t even remember life without her. After 16 years our very best friend passed. Whatever should we do to honor her? How can we eulogize her? How would we ease the children’s pain? We wanted to bury her and give her a dignified, compassionate sendoff with a service that the children would remember. There was nowhere to purchase a pet casket, and it was almost impossible to find a service for an animal geared to both children & adults. The wheels started turning… with the result being this unique kit. We wanted the pet casket to be both eco- and user-friendly for assembly. To our delight we were successful on both counts and we now can offer a USA-designed and patented pet casket, easily assembled, ready for use in just a few minutes – a casket requiring No Nails! No Screws! No Glue! We are proud to say that all our components are made in the USA: our pet caskets are manufactured in Frazeysburg, Ohio using birch wood, and the packaging materials are also products of the USA. We enlisted a professional grief counselor to prepare a family-oriented Guidebook and Memorial Service. The loss of a beloved pet is probably a child’s first experience with the passing of a loved one. We feel it is very important that they be a significant part of the service and participate in all the steps during this difficult time. We at Farewell hope that we have helped your family during this process. We wish you wonderful memories of happier days spent with your beloved pet. 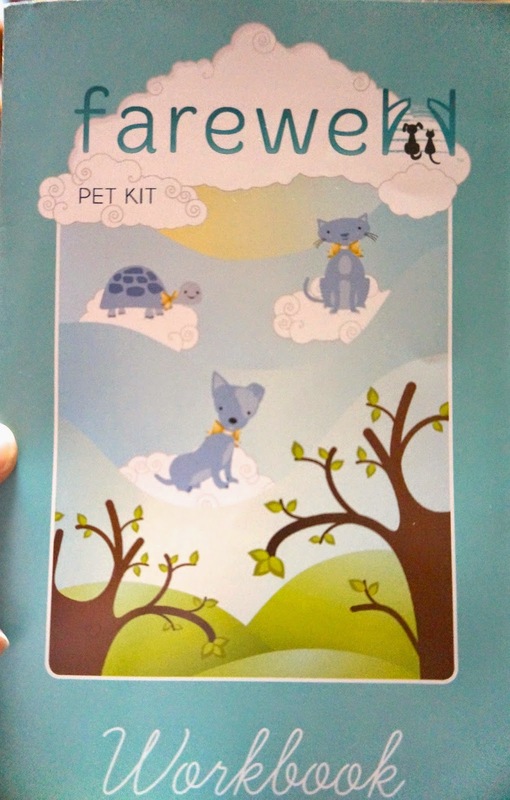 Farewell is going to send a Farewell Pet Kit to one of my neighbors. Please enter this giveaway and share it with your friends. Thanks for stopping by and have a Petacular Monday! Here is a Promo Code you can use to get your pet some great food from Petbrosia. Our Belle LOVED it! Just enter this code: Promotional Code: AUGO60. Petbrosia creates just the right food for your specific pet. They gather information on your pet, activity, size, age, etc and then send you a bag of food directly to your door that is designed for your pet. Thanks for looking and have a Petacular Monday! See you soon! TKD Tournament Had to Share! 4 of the children had a TKD Tournament this morning! They did GREAT and walked away with 10 trophies! I am really excited and just had to share the news. More pictures and maybe video coming Wednesday! That is their instructor with them. He has done a really good job with them. Tea's Cool School Event Ends Tomorrow (8/24)—Save Up to 25%! The first day of school is nearly here, and Tea Collection wants to make sure you have everything you need for your little citizen’s classroom adventure. Save up to 25% during Tea's Cool School Event! During this exciting event, buy 3 items and get 15% off, buy 4 items and get 20% off, and buy 5 or more items and get 25% off! Start shopping now for Tea's seriously smart styles. This event ends tomorrow (8/24), so don't miss out! We just added two Coppertone Sunscreen Sticks. Both of them are SPF 55, one is kids and one is babies. Also two Nail Polishes from Melaleuca. Hurry up and enter! You will find the original post with Rafflecopter - HERE. Then stay on the lookout as we will be adding more! Thanks for stopping by! See you soon! 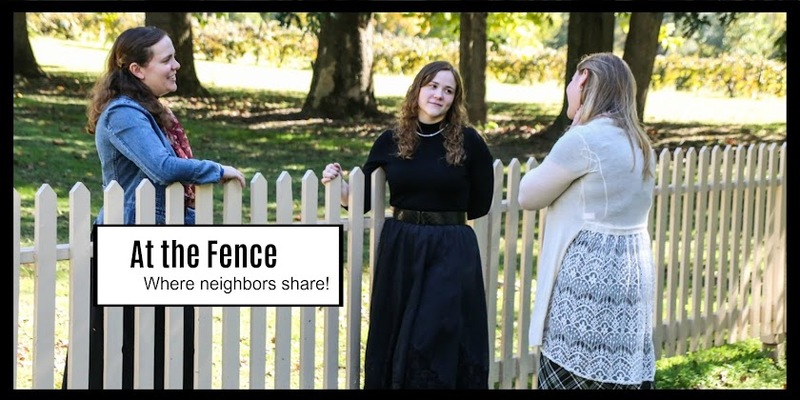 Great News At the Fence!! I have an announcement to make. Two of my daughters will be joining us here At the Fence. Work It Wednesday - Modesty, who has helped here before will be making a permanent move and will be writing once a week about working out, sports, health and other related topics. She is presently taking Tae Kwon Do and enjoys other sports like volleyball, racquetball, and bike riding. She will be posting on Wednesdays. Foodie Friday - Hope will be coming on board and sharing recipes and reviewing products for your kitchen. She loves to bake, so stay on the lookout for some yummy desserts! She will also include restaurant reviews. Petacular Mondays - Lori, myself, will be specializing in pets. All kinds of pets and products for your pet. You never know what I will find. This will be open to fur, fins and feathers. We will continue reviewing family friendly products on Tuesday and Thursday. This should round out our site here, along with allowing us to share the writing load. We will still have special events that will take precedence over our regularly scheduled days. Leave a quick comment and let me know what you think. Any ideas? Feel free to share them with us. We will have an about us page. If you happen to have a product for review, you will find our individual contacts there. Considering Selling Your Old iPhone? Parents do it all! From carpools to school functions, there is never a dull moment. With this hectic schedule comes a lot of expenses, which is why now is a great time to visit Gazelle.com and check out their price lock promotion. With a few quick clicks (perfect for parents on the go) you will get a quote on your unwanted iPhone...up to $325! Consumers that visit Gazelle.com between now and September 9th will get that price locked in and have until October 10th to send in their old phone. Pocket the extra cash to use for back to school shopping or use the money to fund an upgrade to the new iPhone being released in September! Visit Gazelle today, and see what your iPhone is worth! Thanks for stopping by! See you soon, At the Fence! I know several of you have your own blogs. 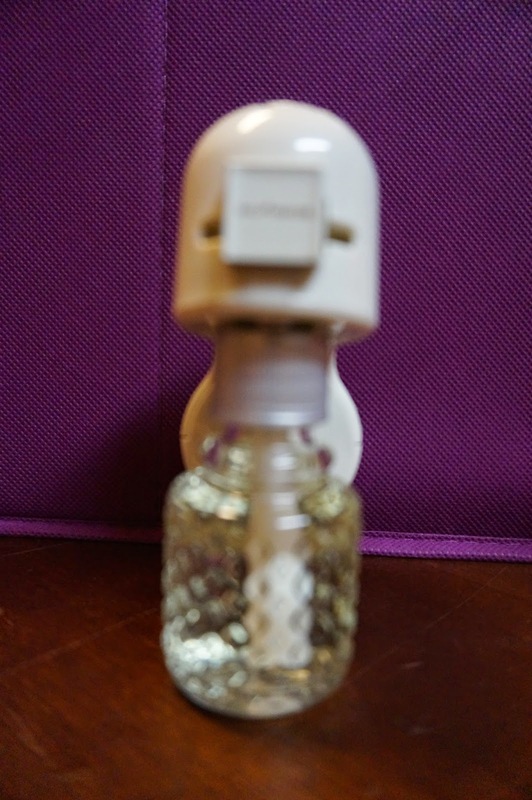 Were you aware that Essio has this amazing Aromatherapy Shower Head Kit and they are looking for the first one hundred bloggers to fill out this form - HERE. What do you think? Are you interested? I am. The thought of an aromatherapy shower sounds great to me. So for those of you interested hurry over and fill out the form! Orkin : Fact or Fake? It's time for Orkin's Fact or Fake! How much do you know about bugs and their habits? You have heard the fables, but can you tell them from the facts? Take Orkin's test and find out! How well did you do? Do you know your facts from fiction? I will say that one of my daughters would find this extremely interesting while her younger sister would not. It used to be the other way around with these two, but as they have gotten a little older, now the teasing goes the other way. Of course her brothers also think it is funny to chase and scare her with bugs. Orkin is there for all your pest control needs, except for older brothers of course! Orkin uses the latest technology and unparalleled training to develop a treatment that's right for your home and your needs. To learn more about pest control that's based in science or to schedule an inspection, visit orkin.com or call (844) 503-8251. Orkin is going to send one of my neighbors there own Back to School Scientific Prize Pack. Disclosure:I received no monetary compensation for this post. Quotes in red are taken from the sponsor's email or website. All thoughts and opinions are my own. Here is what is being added to our Fall Giveaway Box this time... a $5 Bath and Body GC. Then you can choose your own scent! Thanks for stopping in! See you soon, At the Fence! Do You Have a Child Heading to College? I don't tink I shared anything about this yet, but one of my sons is beginning college this week. I am amazed! No, not that he is attending college, but how much of this he did on his own initiative and accomplished in the time limit he had. He has amazed me. To start off, he ad been discussing college for a short time. He is interested in Law Enforcement. He did quite a bit if internet research trying to decide the best route for himself. Online classes? Going away to college? Local community college? He finally decided to go with the local community college. Then al the paperwork began. Looking back at this time, I could really have used the Kaplan KapMap to help us get started. We probably would have begun the process earlier. He was able to complete much of the paperwork online. He filled out the application and the paperwork for grants. He did extra study online to help prepare for the testing process. All of this was in addition to his regular job and keeping up with his chores around the home. When the day for testing arrived he headed out with prayers going up for him. We all rejoiced when he called and said his scores were great and he was planning what courses to take. Immediately following finding out his class schedule he went to work so they could rearrange his schedule around his college hours. Yes, they are actually working with him. I do have to say that we managed to get everything done and he is now ready for his first day this week. I think the KapMap would have helped us in preparing, so I am hoping it will help some of my neighbors out. Click on the KapMap link and you will be able to receive a free 2014 KapMap College Planner. Also if you are planning on enrolling in the Kaplan SAT and ACT course, I have some good news for you. Save $100 when you enroll in Kaplan's SAT and ACT course through 8/28. * Promocode: SHESPEAKS100. Today I want to tell you about Crazy Aaron's Thinking Putty. This putty was designed for adults to remove stress. The Thinking Putty comes in a variety of colors and characteristics. They have glow in the Dark, Magnetic and Heat Sensitive just to name a few. I received the Super Lava, which is a Super Illusion Putty. My other tin is Quicksilver, a Magnetic Putty. Ok, I know children will enjoy this putty, but I want to share that I also enjoy it. I received two cans of Aaron's Thinking Putty for review, and both of them sit beside my computer. Why? So I can play with it while I sit there working. Yes, I play with it. This putty is perfect when you are feeling a little tense or stressed. You can take it out of it's tin and just crush it in your hands, roll it around into a ball, stretch it and my favorite, squeeze it for the cracking noises as the air bubbles pop. The Super Lava Thinking Putty, seems to shimmer and change colors as you squeeze and stretch it. It is orange, red, even copper as the light hits it. The Quicksilver is of course silver, but comes with a magnet as it has magnetic qualities. The putty is not a magnet, but it responds to magnets. Oh, the Thinking Putty also bounces. I mean big bounces. My daughter thought it was fun to bounce it off the hotel wall! We made sure she did it on the wall facing outside, so she wasn't bothering anyone in their room. Check out their Learn Tricks page. It has some fun activities and you can even learn some science while there. Oh, take a minute to follow them on their social media pages. You can find them on Facebook - HERE and on Twitter - HERE. You can purchase Crazy Aaron's Thinking Putty online, or it is now carried in some stores. They nay charge shipping, there are no handling fees. Each tin ($14.95) is packed with 1/5 lb of Thinking Putty. Pick up classroom favorites at Little Passports! For a limited-time only, kids can start the new school year with fabulous Back to School essentials. Choose from a Little Passports Back to School Bundle for only $19.95 or a Little Passports Premium Lunchbox and Chalkboard for only $29.95. Even better, pick up both! Plus, learn about Back to School traditions around the world by checking out the new blog post from Little Passports. Shopping and learning...it's a win-win! Enjoy! Have a great day. Reebok All Terrain Sprint On Sale Today Only! Here's a special going on at Reebok! For just one day (Wednesday, 8/13) the Reebok All Terrain Sprint is on sale for just $66 (regularly $109.98)! Born from the trenches of the Spartan Races, these shoes are lightweight and fast, handle water and mud like an ATV, and can leap barbed wire and bunkers in a single bound. Available in styles for both men and women warriors, don't miss your chance to grab the ultimate gear in obstacle racing at this incredible price. Promo code: TERRAIN. Fall Is Coming Giveaway Box! I have decided to do another giveaway box. We will be adding several things to our new box over the next 4 or 5 weeks. First thing we will add is a Gold Canyon Scentric and Scentre. This is one of their wall plug-ins. The fragrance Scentre is Apple Spice. Hmmmm, perfect for fall! We are also going to add, one Red Hot Cinnamon VoLight. How is that for a start? I think that is good to get us started! Begin entering now and then keep sharing, tweeting and stopping by to see what is being added. Thanks for stopping in today! See you soon, At the Fence! I know most of you know that I homeschool, although I only have two left in school. 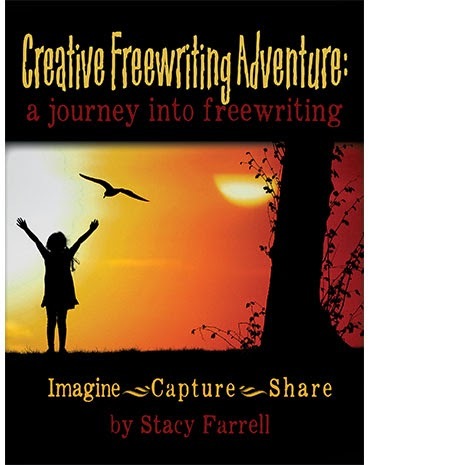 I wanted to tell you a little bit about Creative Freewriting : A Journey Into Freewriting by Stacy Farrell. I recently had the opportunity to review this book and will be using it with my daughter. First of all, this is designed for older students. I would say high school, maybe junior high depending on your students abilities. This would be a good book for helping your student in expanding their creative writing. I will mention here I like that they have several questions in each chapter before the student starts writing to guide them in getting started. The whole goal is to allow the student to be creative in their writing, to expand beyond just facts. I can remember well some of my children's first assignments where they wrote just the facts. The book is broken down into 10 chapters or writing assignments. Each one starts with a short introduction or story, that then leads to the writing assignment. The writing assignment is explained and then there are several questions that will get the student thinking about what they are going to write. The assignment time given to write is 15 minutes, but as the teacher you obviously can vary this for your children. I have one who would need more time. The whole idea is to get them thinking creatively, putting more into their storytelling. SECOND, HELL: Describe the scene in hell and tell us what happens. Background: Is there anything you need to say to set up the scene? ӯ What do you see? ӯ What do you hear? ӯ What do you smell? ӯ What temperature and textures do you encounter? My husband enjoys writing and so does my 13 year old. He is often giving her tips and hints for writing. I like that this book encourages thinking while writing. Many of the assignments include more than just telling what happens next, but why it happens, or why you feel a certain way. I also like the timed aspect of the writing. My husband has often told my daughter that her first writing is often the best, rather than trying to get all the spelling and punctuation correct on the first try, he will encourage her to write out her thoughts and ideas and then go back and correct those things. Not only does Creative Freewriting Adventure encourage thinking and creative writing skills, but I like the emphasis on the Christian faith. I want my daughter to not only know what she believes, but why she believes it. Although the assignments are writing fiction, much truth can be built into it. I do recommend this for older children who have a firm hold on their faith. I questioned a little about bringing in some of the ideas and themes, like re-incarnation and other gods, but when dealt with properly, your child will gain a better knowledge of their own beliefs. I do suggest reading each section yourself and then perhaps going over it with your child if necessary. You can find Creative Freewriting at: http://homeschooladventure.com. Stacy Farrell has other products available on this site. Thanks for stopping by today! Look forward to seeing you soon, At the Fence! Disclosure: I received no monetary compensation for this post. I did receive product for review purposes. All quotes in red are taken from the sponsor. All thoughts and opinions are my own. We are so enjoying our anniversary trip. We went to a dinner theater/gospel concert. The children (well the youngest is 13), put us up in a hotel by ourselves. NICE! And then they took us to Medieval Times, Schaumburg. If you have never been to Medieval times you are really missing out on a fun time. We arrived approx. 45 minutes early. As you check in you receive a colored crown and are told which knight you will be cheering for. Next you have your picture taken with either the King or Princess. You will have the opportunity to purchase one later if you like. At this point you will have time to wander some of their shops, visit the dungeon, and view some of the horses. Shortly before you enter the dining area they have a knighting ceremony. You pay extra to participate in this, but it does provide a special memory for a birthday or other occasion. Shortly after the ceremony ends the Chancellor will make a few announcements and then allow groups to enter the arena dining area based on the knight they are cheering for. The show will begin shortly after you are seated. During the show you will see horses perform, a hawk hunting, and of course the main draw, the knights. They have competitions, jousting, and riding contests. The show occasionally changes, but we always enjoy our time there. My daughters love watching the horses perform. Another fun feature is that as the knights complete a competition they are given carnations to toss to someone in their section. Two of my daughters each received one. Now, while the show is being performed in the arena in front of you, serfs and wenches serve your dinner. We have never been disappointed in the food. There is no silverware, so you eat with your hands. You will receive soup, which you drink from the bowl, along with chicken, riblets, a potato, garlic bread, and a fruit filled dessert. I highly recommend attending the Schaumburg, Medieval Times Dinner & Tournament. They put on a fabulous show and serve a delicious dinner. I am sure you will not regret going. Take a minute to watch the slideshow. The very best news though is one neighbor is going to receive 4 tickets to the Medieval Times Schaumberg Castle. Yes, you heard right, 4 tickets. Are you ready to enter? Let's go! Thanks for stopping in today! I look forward to seeing you again soon. Disclosure:I received no monetary compensation for this post. All quotes in red are taken from the sponsor's website. All thoughts and opinions are mine.